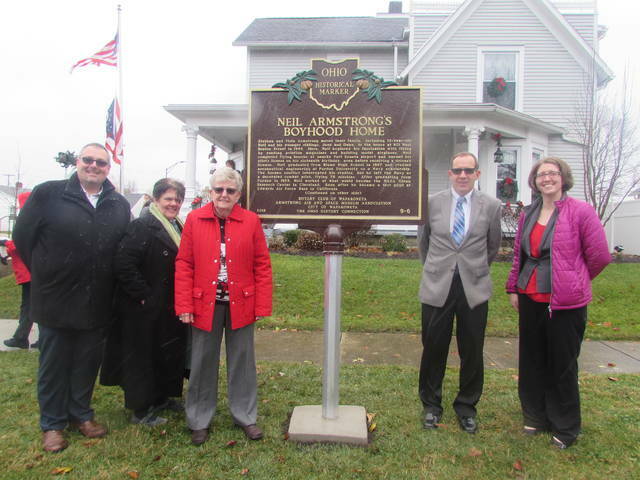 From left standing next to a historical marker in front of Neil Armstrong’s boyhood home are Josh Little, Wapakoneta Rotary Club president, Rachel Barber, 2019 celebration committee member, Karen Tullis, homeowner, Tom Stinebaugh, Wapakoneta mayor and Brittany Venturella, Armstrong Musuem interim director and curator. WAPAKONETA — Neil Armstrong was the first man to walk on the moon, and a historical marker to honor him was unveiled at his boyhood home in Wapakoneta Monday. The Wapakoneta Rotary Club, Armstrong Air & Space Museum and Ohio Historical Connection hosted an unveiling ceremony at 601 W. Benton St. where Armstrong grew up with his parents Stephen and Viola Armstrong and younger siblings, June and Dean. Karen Tullis currently lives in the home she purchased in 1988. She said she was approached a year and a half ago by the Armstrong Museum and then the Ohio History Connection about having the marker installed at the home. Tullis is a retired principal from Northridge Elementary School and Blume Junior High and knows the importance of preserving and teaching about history. “Being a history major who has taught Ohio history, I wanted to preserve as much history as we can. I thought it was a great opportunity to share with others since I have visitors to the home from Germany and Japan among other places,” Tullis said. It was a year and a half process to get the bronze and medal plaque ordered and made from Marietta, Ohio. Tullis made the decision to place the marker in front of the home where it would be visible to those who pass by. It was installed by Wapakoneta city employees. “He was the first man to walk on the moon and dedicated his life to becoming an astronaut and becoming a part of the NASA program and not everyone can achieve those things,” Tullis said. She did not meet Armstrong, but met his parents and said they were genuine and nice people who would do anything for everybody. Joshua Little, Wapakoneta Rotary Club president, said the club was able to raise the $2,500 through fundraisers that was needed to complete the marker. “Our motto is ‘service above self,’ and Neil certainly put his country and family above himself, and this is a great example of how Rotary can give back to someone who gave so much to our state and country,” Little said. Brittany Venturella, the Armstrong Museum interim director and curator, said the museum worked with Ohio Historical Connection and community members to come up with the content for the marker. “We see people from all across the United States and different countries visit the museum because the act of walking on the moon really brought people together,” Venturella said. She said she hopes visitors learn about the small town boy who grew up in the home and the man who played the key role in the first man landing on the moon. https://www.limaohio.com/wp-content/uploads/sites/54/2018/11/web1_IMG_1731.jpgFrom left standing next to a historical marker in front of Neil Armstrong’s boyhood home are Josh Little, Wapakoneta Rotary Club president, Rachel Barber, 2019 celebration committee member, Karen Tullis, homeowner, Tom Stinebaugh, Wapakoneta mayor and Brittany Venturella, Armstrong Musuem interim director and curator.